Toyohara Kunichika (1835-1900) Biographies of the Loyal Retainers (Gishi Meimei Den): Ichikawa Danjuro as an Unidentified Ronin, 1895. Oban. The article on the gallery blog deals with the story of the Chushingura in some detail. In summary, the great revenge drama of Japanese theatre - the Kanadehon Chushingura of 1848 - is the stage dramatisation of a real incident that occurred in 1702. Because of the stringent censorship at the time, preventing the portrayal of recent events, the setting and many of the characters have been transposed to the fifteenth century. Hence the subject of the play - the enforced suicide of feudal Lord Asano of Ako and the revenge of 47 of his now redundant retainers (ronin) - becomes the suicide of Lord Enya Hangen, a character borrowed from another story and embroidered to fit the role. Of course, theatre audiences and the disenchanted Edo towns people would have have known all of this and to emphasise the point, actors and artists were comfortable to use the Asano family crest on their cobbled together stage persona. 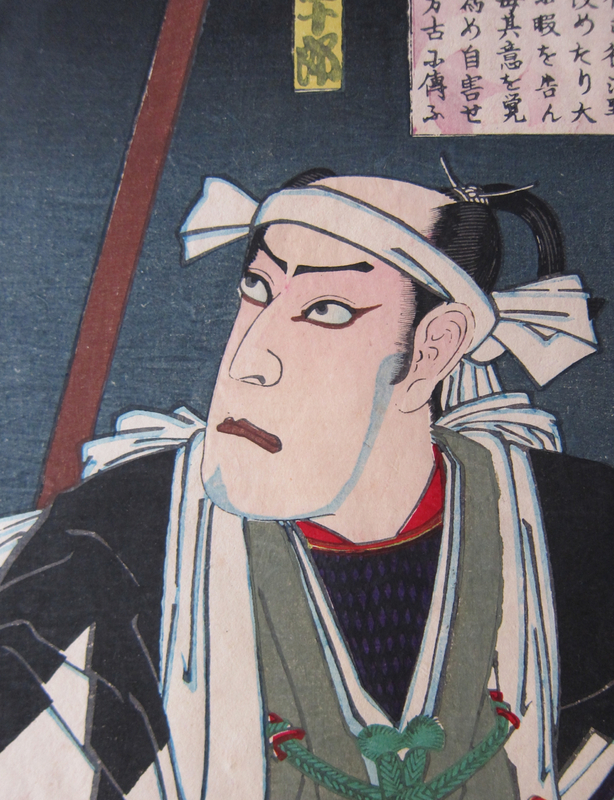 The most famous series of prints (and the definitive one) is really Kuniyoshi’s series of 1847, The Faithful Samurai. This epic single portrait series was massively successful, and set in train any number of series by other artists of which this very rare series by Kunichika is maybe the last in an illustrious line. Kuniyoshi’s masterwork was an historic account - in as much as there is much speculative written history on each sheet. 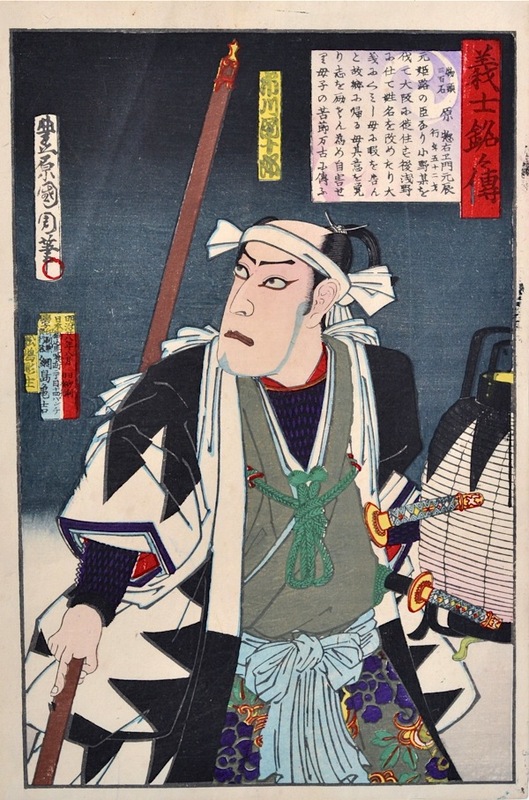 Kunichika’s 1895 series (one of his last great series) is in a different tradition: that of the actor portrait using an apparently unrelated subject matter as a vehicle, in this case, portraits of kabuki actors as illustrious heroes of the great Chushingura. This is a very fine series from Kunichika’s late Meiji period, the drawing is bold - aggressive almost. There is a bravura quality to each of these portraits which is mirrored in the boldness of the traditional dog tooth design of the makeshift uniforms. In this portrait of Ichikawa Danjuro, Kunichika borrows from the long tradition of Ronin portraiture: the long text cartouche describing the character's exploits, the sundry props - in this case a lantern that has been decorated with the distinctive black and white ronin pattern; and the tools of the ronin’s trade - spears, swords and the paraphernalia of killing. These late prints signal the end of the indigenous Japanese art of drawn representation. They are anxious pieces, these and similar late works by Kunichika’s colleague Yoshitoshi… sitting between the wave of European culture that was to break across Japanese art at the end of the century and the dying light of Edo culture. Yoshitoshi was perhaps better at assimilating these changes than Kunichika who peers at us from his only known photograph as if from another life. A very fresh print... colour, condition and impression are fine, but there is an urgency in these prints that gives them a different aspect to similar series of the decade. Rare and exceptional with full margins. Some mica to the background.